On June 10 1984 the Greater London Council, on the verge of being abolished by Margaret Thatcher's Conservative government, put on the 'Jobs for a Change' festival by County Hall on the South Bank. 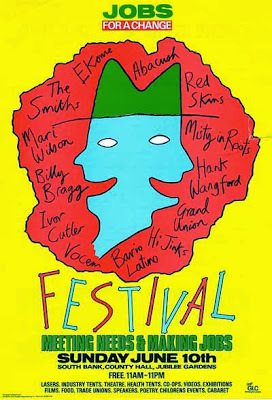 I was one of the estimated 150,000 who went along, with the line up including Billy Bragg, Misty in Roots, Mari Wilson, Hank Wangford, Gil Scott-Heron and Ivor Cutler. 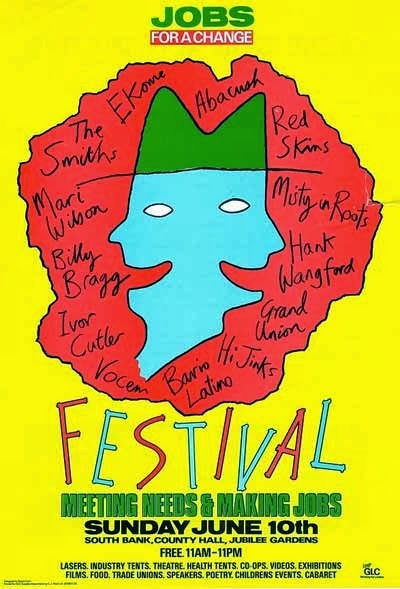 The biggest draw was The Smiths - it was the fourth and last time I went to see them, and in less than a year they had gone from being third on the bill at the Lyceum (where I saw them supporting the Gang of Four) to becoming the focus of something like mass hysteria. Socialist band The Redskins played too, and while they were on stage a largish group of neo-nazi skinheads stormed the stage and attacked people in the crowd. Although the fascists were massively outnumbered by the festival goers, many of the latter fled in panic. Indie kids were never known for their streetfighting skills! 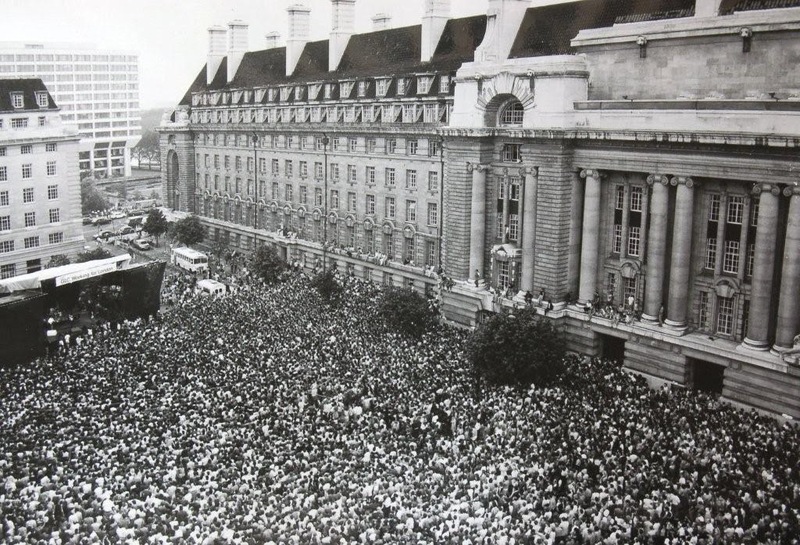 I wasn't very handy either but I did end up with a group of punks, anarchists and Red Action members chasing the nazi boneheads round the South Bank, and who knows in the scuffles that day I may have had an encounter with the late Nicola Vincenzo Crane. An interesting article by Jon Kelly at the BBC News Magazine recalls that among the fascist skins that day was Nicky Crane (1958-1993): 'As The Redskins, a socialist skinhead band, played, Crane led an attack on the crowd. Around 100 fascists began setting about the audience closest to the main stage... The neo-Nazis were beaten back by a group of striking Yorkshire miners, invited to steward the event by Livingstone as a solidarity gesture, and members of the militant far-left group Red Action. Crane was not cowed, however, and after regrouping his forces, he charged a second stage at the other end of the park where the Hank Wangford Band were playing. This time, however, the anti-fascists were better prepared. Militants grabbed empty cider bottles to use as improvised weapons. As the anti-fascists fought back, Crane broke away from the main battle. "He was busy attacking the rest of the crowd, on his own, stripped to the waist," says Gary [an anti-fascist present]. As Crane tried to make it over a barrier on to the stage, he was knocked over by a Red Action member. He escaped the furious crowd by using a female left-wing activist as a human shield, according to witnesses. As the violence subsided, anti-fascists confronted another skinhead in the crowd. His Harrington jacket was unzipped to reveal a slogan on his T-shirt. 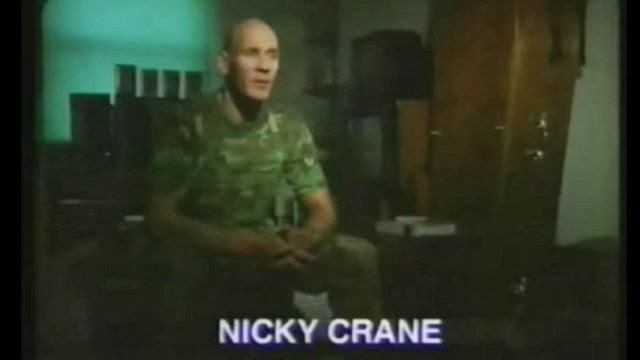 It read "Nicky Crane", in tribute to the young man's hero. Given the carnage Crane had just instigated, the left-wingers had little sympathy for his admirer. The skinhead was set upon and beaten'. 'The skinhead gang marched in military formation down the High Street clutching iron bars, knives, staves, pickaxe handles and clubs.There were at least 100 of them. They had spent two days planning their attack. The date was 28 March 1980. Soon they reached their target - a queue of mostly black filmgoers outside the Odeon cinema in Woolwich, south-east London... The Woolwich Odeon attack of 1980 was described by a prosecutor at the Old Bailey as a "serious, organised and premeditated riot". After their intended victims fled inside, the skinheads drilled by Crane began smashing the cinema's doors and windows, the court was told. A Pakistani man was knocked unconscious in the melee and the windows of a nearby pub were shattered with a pickaxe handle. In 1981 Crane was jailed for his part in an ambush on black youths at Woolwich Arsenal station. As the judge handed down a four-year sentence, an acolyte standing alongside Crane stiffened his arm into a Nazi salute and shouted "sieg heil" from the dock'. 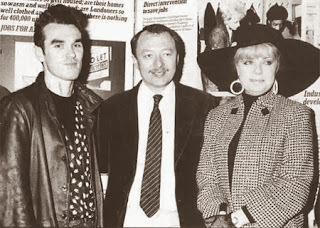 As Kelly mentions Crane was gay and by the mid-1980s was being spotted out at London gay clubs such as Heaven. To start with he continued his involvement with the far right but in 1992 he not only came out as gay on a TV programme but renounced his previous nazi beliefs. The following year he died from AIDS. Kelly's implies that it was Crane's increasing identification with the gay scene that led him away from the homophobic far right. That may be true, though Crane certainly wasn't the only gay man in the British neo-nazi scene in the 1970s and 80s. Another key turning point was doubtless in 1990, when Crane got a taste of his own medicine when he was knocked unconscious by Anti Fascist Action activists in the vicinity of an Irish demonstration in Kilburn. A mostly wasted life, but at least he doesn't seem to have died a nazi. Crane tried to organise in the London Apprentice and the group that I belonged to, Islington Anti-Racist Anti-Fascist Action, responded by leafletting the pub, "outing" as it were, the nazis. Around the same time Ian Stuart and two others were arrested for the attempted murder of a gay man on a bus in King's Cross, after the victim and his partner left the Bell pub. Stuart was held on remand, but never convicted- to my mind a botched investigation. There's more to the story about "Gentle Touch Promotions" - the security firm of Stuart & Crane. @PanditG I think the gay/nazi angle is more complicated than Kelly's article suggests. Was there really a straightforward dichotomy between the two, so that ultimately someone like Crane had to choose one or the other? It's true that the far right was/is generally homophobic, and of course the Nazis killed gay men as well as Jews. Equally it's true that in the UK, and many other places, the LGBTQ mainstream has been resolutely anti-fascist. But there has often been a gay subculture amongst fascists too, and some aspects of the gay appropriation of the skinhead look at that time was problematic in my view when in a minority of cases it crossed over into a flirtation with not just the skinhead look but the fascist skinhead look, wearing union jack patches etc. Not that they necessarily fully embraced the politics that went with it, but one argument I remember having was about taking responsibility for the threatening meaning of some images. Was it ever OK to walk down Brick Lane looking like a fascist, possibly spreading fear by so doing? in such cases the intention/sexuality of the person was irrelevant in my view. One indie kid of my acquaintance, a most mild mannered wallflower, did in fact stick his leg out during one the nazi rampages at the festival and trip one of the rather large scumbags up. The fash got up ready to square up but on seeing the wimpy pallid teen just dusted off and continued to run. Well done that indie kid!